For a upcoming scout camp this summer, adults in our ward were asked to review the 131 current merit badges and select one that they could serve as merit badge adviser. Looking through the list, I was disheartened to find just how useless my, um, skill set is. 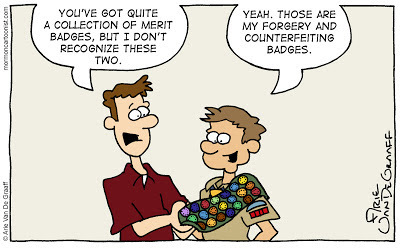 There currently is no merit badge on popular culture trivia, cookie tasting, or even cartooning. This naturally inspired today's gag. 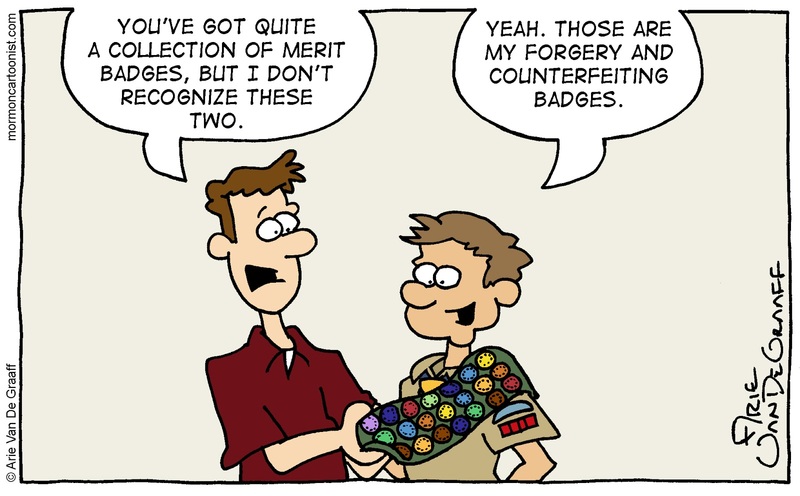 If you were in charge of approving merit badges, what would be the first new badge you'd approve? Your skills are useful--even role-playing (you never know when you might meet a cave troll). Tower-of-Babel building? After all, you're learning a new language. A clean room for 2 days in a row. That wouldn't make a good badge. Too few scouts would earn it.